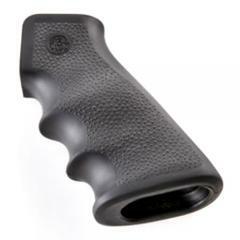 This Hogue grip for the AR-15 and M-16 replaces the factory grip on those popular rifles for enhanced comfort and stability during use. It is made from durable overmolded synthetic rubber, allowing it to resist wear effectively. Unlike natural rubber, it will not degrade if exposed to firearm solvents and oils. Its textured surface provides a non-slip grip, and the molded finger grooves on the front fit naturally into your hand to enhance security and control. The soft material also helps to reduce recoil impacts. The internal storage space fits up to two AA batteries for your light or laser, and is accessible through the bottom of the grip. Love the Hogue grips, I put this on my 870 Bullpup conversion because the factory polymer was just too slippery. Now, I can grip this rifle in any condition.